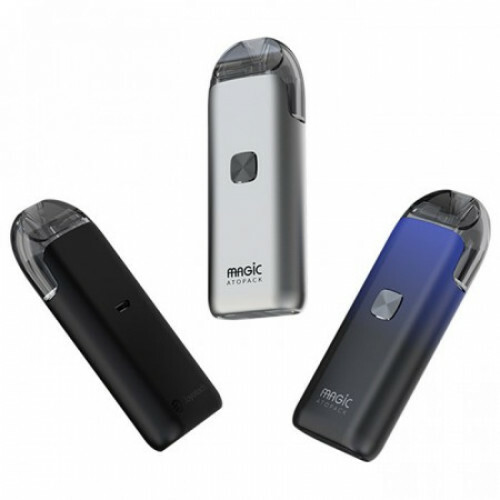 The Joyetch ATOPACK MAGIC Pod System is an innovative creation, incorporating the NCFilm™ Heater Element, a 2mL/7mL juice capacity, and features a large integrated 1300mAh rechargeable battery to set this nicotine salts device apart. The ATOPACK Magic Pod utilizes a whopping 7mL juice capacity and includes a bottom refill system, stoppered by a silicone and plastic flap. Underneath the flap is the NCFilm™ Heating Element, practical for elongating the lifespan of the unit. In addition, to replace the cotton, the pod must be accessed from the bottom to reveal a square of organic cotton to wick the juice within. Firing at 0.6ohms at the press of a button, the ATOPACK Magic Pod system is powered by an integrated 1300mAh rechargeable battery to produce nice thick nicotine laden clouds. The Joyetech MAGIC is a sensation vape pod offerings!